Have you noticed how the weather has changed overnight and we’re now in Autumn? We’re adjusting to dark mornings and treading on a carpet of fallen leaves whenever we leave the house. There is plenty to keep us busy though thanks to Super 4 which is a fab new animated CITV series, inspired by PLAYMOBIL! Have you seen it yet? Shaped around popular Playmobil worlds such as Pirates, Fairies, Knights and Top Agents, the series follows the adventures of four new heroes Alex, Gene, Ruby and Twinkle. 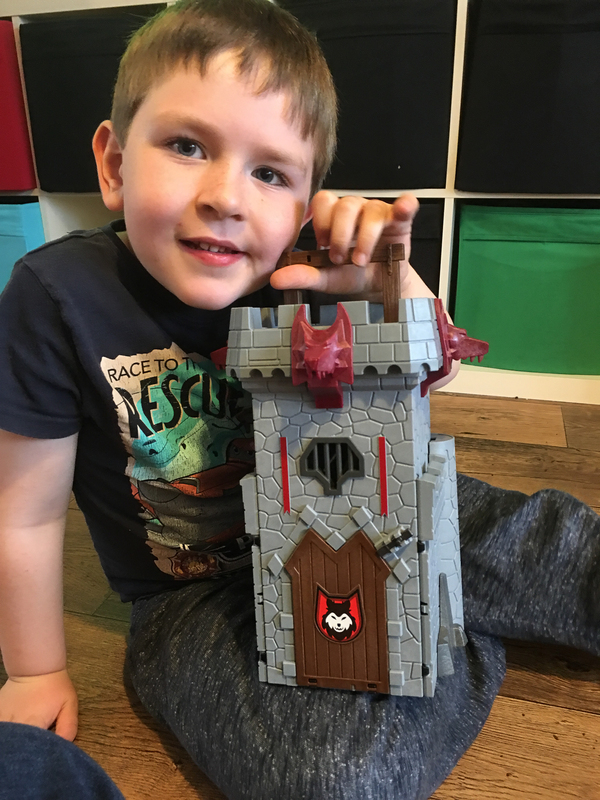 The brand new toys from the series have just launched and we were delighted to receive the Black Baron’s Castle Play Set to review as we’re a Playmobil Playologist family. The Super 4 Take Along Black Baron’s Castle has many different features to help keep unwanted company away. There is a bow at the top of the castle to fire flaming arrows at enemies wanting to steal the chest full of treasure which is being guarded by the Black Baron and his men. The set also features a break through wall and a drawbridge which can be lowered or lifted in order to protect the castle. The set features three Super 4 figures including the Black Baron and lots of accessories. The Playmobil Super 4 Take Along Black Baron’s Castle playset was easy to put together, has lots of play potential and folds away when not in use. It costs £44.99 and is available from Amazon and all good toy shops. The darkness came so suddenly. We struggled to get out of bed now. I love Playmobil stuff….erm, I mean, my kids love Playmobil. LOL. I’ve got a couple of sets earmarked for Xmas. I think Playmobil stuff is great but did you hear about the complaint that was made about their Pirate Ship? It’s all over social media today. Ah this looks great, what great review. I really love the look of the playmobil stuff – I can’t wait to get some for my daughter. This is so cool. I love PlayMobil and it’s so great there’s anew series around it accompanied by toys like this. I am loving the look of the Black Barons Castle and I used to love playing Playmobil as a child. I hate that is dark 🙁 you have less motivation and all suddently you tired.. well me.